With every donation to CAN Fund you find out the name of the athlete you have supported and receive a tax receipt. Recently, over 800 athletes able-bodied and Paralympic from coast to coast applied to CAN Fund for direct financial support. Where CAN Fund plays a significant role is in the years leading up to the Games, the years when no one is watching or cheering or even aware of our athletes and their journey to be the best in the world. The majority of our athletes are paying for travel to training camps and competitions, equipment, coaching, proper nutrition and “team fees that can range from $500-$27,000. Training & Competition: Many athletes are responsible for the costs associated with travelling to training camps and sometimes even competitions. An optimal training environment plays a critical role in an athletes performance. Some athletes travel to climates best suited to the weather they will be competing in while some travel to locations to surround themselves with the best competition or to have access to the top training facilities and resources. Many athletes are also charged an annual “Team Fee” that depending on sport ranges from $500-$27,000. This “Team Fee” primarily covers costs associated with travelling to important domestic and international competitions and tournaments throughout the year. The majority of Canadian athletes spend most of the year away from home and on the road travelling and competing. 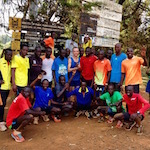 Approximately how much does it cost you to attend a training camp in Kenya? How many hours do you spend training or competing at a camp on average per day? 4 hours/day, 26km-38km running plus drills, stretching and core exercises. How long do you go to Kenya for and how many times a year do you go? I usually go for 5 weeks but have been as long as 7 weeks. This year I went twice, 5 weeks each time and I have been going every year since 2011. What is a typical training day in Kenya for you? Wake up at 5:40am. Run at 6:15am. Breakfast at 8am. Core at 10am. Lunch at 12:30pm. Nap at 2pm. 10km run at 5pm. Drills at 6pm. Dinner at 7pm. Sleep at 9:30pm. How much does it cost each time you relocate to be at training centre for an extended period of time, is this self-funded or partially funded? While generally accommodation and travel are covered for national team training camps, myself and several others relocate to the vicinity of training centres in order to have access to top facilities outside of camps, and this relocation is entirely self-funded. For example, I lived in Southern California from September to April since the LA Velodrome was the only facility at the time and I paid all associated costs of living including rent, utilities, gas, food, and out of country medical insurance. Similarly, I have now re-located to Colorado since the team trains there during the summer and early fall and again I am completely on my own there. The cost of living away from my home in BC in order to make use of the training sites that the national team frequents is around $1500-2000 per month. When you need to be in Milton Ontario, California or Colorado for team training camps how long is it usually for? Training camps generally last from 10-14 days, but again as a track cyclist there are limited facilities where we have access and coaching assistance so in order to train optimally outside of camps we make a significant personal investment in order to remain competitive from camp to camp. I generally leave for the track around 8am, get a break from 1-3pm, and are then back at the track and/or in the gym and on the road until 7:30pm. It’s definitely some long days! How many months of the year approximately are you travelling for training camps or competitions? Between the track and road I train 12 months of the year with only a week or so in between seasons. This year I will have been racing every month of the year, and similarly we have training camps of some capacity all year long since all track endurance riders compete on the road outside the track season in order to build endurance. What does a typical training day look like for you? I wake up at 7am. Arrive at the gym at 8:30am for weight training (60-90mins). Leave for a ride or the track around 12:30pm for 3hrs. Finish my day of training with yoga to facilitate recovery and unwind. Do you pay an annual Team Fee? If so, how much? Team Fees vary from $0 (A team), $10k (B Team), 15k or 20k (C Team), and $25k I believe for discretion athletes. This is the first year I don’t have Team Fees as my results qualified me for the A Team. Over the past 7 years on the team my fees have totalled $95,000. How many hours do you spend training on average per day? An average day would be around 5 hours, 5 to 7 days a week depending on the training block (summer). Winter it’s generally a bit longer, split between on and off snow training. Approximately how many months of the year are you travelling for training camps or competitions? We travel 8-9 months for on snow training, with summer dryland training it adds up to 11 months. We take 1 month off after the season to regenerate before getting back in the gym full time. During the summer months do you travel to other locations for on snow camps? Are these trips self-funded? We do travel a lot, as noted above. Our annual team fees cover almost every aspect of our on snow training and travel. However, the summer dryland months are completely up to us to fund on our own with no real team assistance. Are you responsible for paying for travel and accommodation at all throughout the year over and above what you pay for your annual team fee? Anything team related and for on snow camps or races is covered by team fees, summer dryland training is fully self-funded. Do you pay an annual team fee to be on the national team? If yes, how much? We currently have to pay a $5,000 team fee, just to be part of the National Team. How many hours do you spend training on average per day? In the shoulder season I will be in the gym, or training 4-6 hours a day. When the snow is flying we will be on hill all day and in the gym cooling down and stretching afterwards, 6-7 days a week. In the summer we are chasing the snow around the world, heading to New Zealand, South America training more than in the winter, more gym time and more on snow time. How many months of the year approximately are you travelling for training camps or competitions? When we can afford to do it all, we would be on the road ten months out of the year, September and maybe May are our down months, but we are still able to be on snow at those times, depending on conditions. During the summer months we usually head to New Zealand for about a month. All out of our own pockets, the flight is around $2000, accommodation about $800 if sharing with others, food $500, lift passes $500, transport (you have to drive literally up the mountain everyday 1hr) $300 sharing costs with teammates. This is just to ride with the public, if we are talking about a camp that is extra, around $2,000-$3,000 added. Are you responsible for paying for travel and accommodation at all throughout the year over and above your team fee? 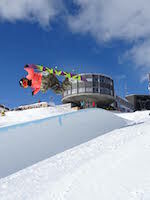 Yes, we get little to no support from our Nation Team, we pay our team fee of $5000/year as well as all of our competition entry fees, travel fees, accommodation fees, food, lift tickets, everything you name it, we fund it ourselves. A year of competing for me is around the sum of $25,000. Equipment: Athletes rely on their equipment in order to train and compete. Having the right equipment, often custom or specialized is crucial to their overall performance. In order to compete on the world stage, equipment and technology plays a critical role in keeping a level playing field amongst top competitors. Some sports are determined by the smallest of margins and equipment can often be the difference. 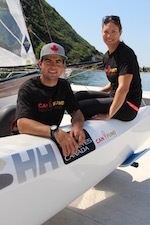 From having enough beach volleyballs to train properly at $60 each, to a $3000 kayak. For some athletes having a reliable vehicle or bike to get to and from daily training sessions can be considered a crucial piece of equipment as well. Trampolinist Rosie MacLennan Canada’s only Olympic Gold Medalist from the 2012 London Games and multiple recipient of CAN Fund was able to fix her “old and ailing” car prior to London with the funds she received from CAN Fund so that she could attend her training sessions. 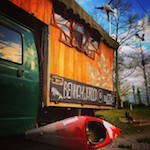 Aside from Ben’s kayaks another very important piece of his “equipment” is his van that he built as his home and transportation while training in Europe. How much was it costing to attend a training camp in Europe prior to your van? How much does it cost now that you have your van? For a month in Europe, we were typically looking at $4000-$5000 when you include flights, accommodation, food, coaching, water time, and race fees. I have cut that down by one third with my van which is making a huge difference. It’s also much nicer to be sleeping in my own bed and generating my own electricity. It has helped psychologically by getting rid of the ‘homesick’ aspect of training camps. 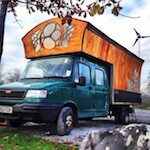 Approximately how many km’s do you travel in your van around Europe in a year? Since I bought the van last year, I have put 20,000km on it and it has been in 11 different countries. By the end of this summer I will have racked up another 10,000km and have added three more countries to that list. Fuel and toll roads have become a large expense to tackle but compared to paying for hotels, rental cars, and flights within Europe, it is much cheaper. How many months of the year are you in Europe or out of country? I am out of country for about 10 months of the year, now that I have my van as a resource. Approximately 9 months are spent in Europe with the rest of the time divided between Canada and a southern hemisphere training location in the winter. During the race season it tends to be around 4-5 hours per day. In the off season I am spending 6-7 hours a day training. How much does a volleyball cost? Each volleyball is about $60. Needing 20 balls a year means spending $1,200+ on beach volleyballs for training. How many hours each day do you spend training? On average we are training 3 hours per day (sand and strength). How many months of the year are you out of country travelling for training camps and competitions? We are out of the country for 6-7 months per year. – 6am wake up. Breakfast and travel to training centre by 7am, arriving for 7:45am. – 8-10am training at centre. – 10am recovery snack and team meeting. – 10:30am travel to CSIO for weights. – 12-2pm strength and conditioning. – 2:00pm recovery snack and lunch. – 4-6pm this is the time for therapy appointments, grocery shopping, emails and scheduling any important travel. – 7pm relax make lunch and snacks for next day. Coaching: Coaches are an integral part of any athletes performance. An athlete does not get to the podium alone. The expertise, technical analysis, mentorship, knowledge and relationship shared between a coach and an athlete is significant to reaching ones full potential. Many athletes are responsible for paying for their coaches and therefore sometimes compete without them at important competitions due to cost. 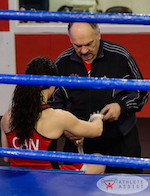 Other athletes relocate to training centres around Canada and even the world to be surrounded by the best coaching. As each athlete is very different and has different strengths and areas of improvement, aligning with a coach that is right for them is crucial to their continued growth and development both as an athlete and as a person. Coaches ensure our athletes are prepared and poised for success on the world stage. Do you pay for coaching? If so, how much? Yes, I pay my gym fees of $200 per month as well as any other associated fees with training camps. Does your coach travel with you when you compete? Not always. My coach will travel with me to national events and some international events depending on funding available. When my coach travels with me I am responsible for his expenses. Are there other costs associated with coaching? 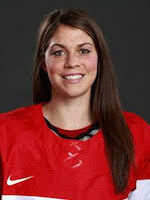 I have relocated from Kitchener to Toronto over the past year and a half to work with a new coach. So there have been many associated fees, rent being the major one. I stay in Toronto during the week for training then I go back home to Kitchener on the weekends. Travel expenses are also a big expense but being able to go back to Kitchener to spend time with my support system helps keep me motivated and balanced therefore a necessity for me. How many hours do you spend training on average per day? 5 to 6 hours per day. What does a training typical day look like for you? I wake up at 7am and run or do a sprint workout in the morning. In the afternoon I’m either doing a strength training workout or a technical workout with my boxing coach. Then in the evening I am back at the gym for another boxing workout which generally includes sparring and bag work etc. Do you pay for coaching? If so, how much? We don’t have it in our budget to pay for coaching i.e. his time. We have an odd situation in that we don’t actually pay our coach because we don’t have the money to do so at the moment. However, we are paying for all his expenses and hope to be able to repay him for all his time and efforts once we have more money in our budget. Until then, we are all working towards the same goal of getting us a medal at the Olympics, and doing what it takes to get there with the money we have. Does your coach travel with you? Yes, Ian does travel with us, it’s a necessity, we don’t ever train at home and we pay for his expenses. Are there other costs associated with Coaching? Our coach Ian is from Seattle, but like us sailors, we are on the road all the time and it almost doesn’t matter where you are from because you hardly go home. Of course flights, accommodation and food are the typical expenses we have with our coach, a daily rate or salary is also normal but in our case, just put on hold until we have the money. Other costs incurred with coaching sailing is a coach boat, either a chartered one or you need to buy one which is $10,000, a trailer to tow it around from venue to venue, which means you need a car with a tow hitch (rent or buy again) and it costs about $50/day in gas to run the boat. Most regattas we have to pay an entry fee for the coach too. Is your travel and accommodation self-funded, if so approximately how much does it cost to travel to a competition? Yes, everything we do is self-funded. Typically a competition in Europe (6 day event with 5 day lead up plus 2 travel days) would cost our team approximately $11,000. This includes expenses for Nikola, Luke and Coach Ian – flights 3x$1500, accommodation 12 x$240, food 14x$150, gas (boat & car) $1000 and entry fee $500. 3-5 hours on the water, 1hr + briefing/debriefing: learning tactics/strategy, 1+ hours dry land and 2hrs of boat maintenance. How many months of the year approximately are you travelling for training camps or competitions? Approximately 9 months per year. Does your coach travel with you when you compete? At least one coach always travels with me when I compete with my partner. When we are representing Canada at international events, their flight is covered and at international championship events their accommodation is covered as well. They’re billable hours are still our responsibility and we have to pay for everything for any domestic events. Do you pay for coaching? Yes, I pay approximately $25,000 a year when it is split between all of my coaches. What other costs are associated with coaching? 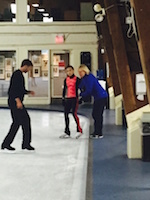 In skating we have a lot of different coaches that cover a lot of different aspects of our skating. 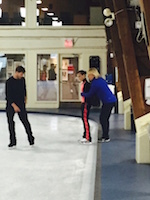 We have two pair technical coaches, a skating and polishing coach, a choreographer and an acting coach. 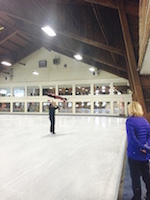 Choreography for two programs can run us around $10,000/season. How many hours do you spend training on average per day? On average we spend about 5 or 6 hours a day on training. How many months of the year approximately are you travelling for training camps and competitions? I travel for competitions between 7-8 months a year. Are there any other major expenses associated with Figure Skating aside from Coaching? Equipment Costs: Costumes are about $6,000 each season for my partner and I. Our skates are provided by Jackson Ultima Skates and our Ice time costs approximately $5000/year. Does your coach travel with you when you compete? There is a head coach who oversees the National team for all five disciplines – he is based in Ottawa and comes to the most important competitions (example: World Cups, World Championships and Olympics). He doesn’t come to Continentals or National competitions, and sometimes misses a World Cup also, due to money. We have a fencing-specific coach (and discipline-specific coaches for each discipline)… the fencing coach is one of the most important to have at a competition. Ideally he would come to every competition and training camp, however that is just not feasible with the Pentathlon Canada budget – Pentathlon Canada did pay for an Ottawa-based fencing coach who is great to come to a World Cup and World Champs; however there were no funds to have a coach at most competitions and he is not my personal Toronto-based coach. Bringing my fencing coach to at least one competition (World Cup in Rio in March) as well as the Olympics is a fundraising goal of mine this year. Do you pay for coaching? If so, how much? Each discipline has its own coaching fees and I pay for all of it. The most expensive disciplines are fencing and riding. Fencing lessons are $25 per 30 minutes and ideally one does 3 lessons per week. This year, my coaches and I have all agreed that fencing will be the most important area for me to make gains that can make it a medal-winning Games… that means nothing else can be sacrificed, however it will take extra attention to fencing and extra fencing lessons. 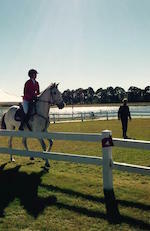 Riding lessons are $40-60 per hour and ideally one does 1-2 lessons per week. Shooting, swimming and running coaching is relatively inexpensive (example just club fees and special occasional fees for a workshop or training camp). How many hours do you spend training on average per day? On average there is 4-6 hours of pure training per day. There is also a 1:1 ratio for amount of time for travel/changing/setup/clean up relative to each hour of training. So a day starts at 6am and can end at 9pm, and includes 8-12 hours dedicated to training or supporting activities. How many months of the year approximately are you travelling for training camps or competitions? I would spend more time training away from home – there are almost always international training camps being held that last between 1 week and 1 month; however the limiting factor is funding. These camps typically cost $40-60 per day to attend. However, because Canadian Pentathlon infrastructure is not as developed as in Europe, the quality of training alongside pentathletes in Europe is a great boost. I travelled approximately 1 every 4 weeks last year. However, in my ideal training year I would spend as much time as possible training alongside the teams of other Olympic-bound athletes who are at international training camps much of the year (e.g. 60-75% of the time). 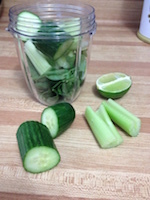 Nutrition: Proper nutrition plays a critical role in an athlete’s performance. The importance of properly fuelling their bodies with the right food and at the right time is a strong factor in allowing an athlete to train and compete at their best. Proper nutrition not only impacts performance but also the ability of an athlete to properly recover to ensure they are able and ready to compete at the highest level each and every day for 4-6+ hours of training and/or multiple training sessions throughout the day. It varies for each athlete but in general athletes will eat anywhere from 3000-8000+ calories a day depending on their sport and training block. Many athletes follow very specific diets and nutritional plans, require certain supplements and meet regularly with nutritionists to optimize their training. Fuelling with the proper foods is expensive but key to reaching one’s full potential. How many calories a day do you typically need to eat? Typically a hockey player during training or in season will need to eat a substantial amount of calories a day. We tend to burn a lot of calories during games and practices so it’s important to get enough nutrients in your body during and right after a workout or game. I would say around 2500-3000 calories a day. What is an example of what you eat in a typical day of training? How many calories a day do you typically need to eat? Anywhere from 3,000 – 6,000 depending on the type of training we are doing. How many hours spent training or competing on average per day? Each day we spend 5 hours in the water, 1-2 hours out of the water training. We also generally have about 15-20 competitions a year. How much do you spend on groceries each week? Generally I spend about $200/week on groceries. How many calories a day do you or Soccer Players typically need to eat? Around 2500-3500 calories a day, depending on the day (one training session vs two training sessions). How many hours spent training or competing on average per day? Depending on if it’s a single or a double session day we could spend anywhere from 3 to 6 hours a day training respectively. What is an example of what you would eat in a typical day of training? 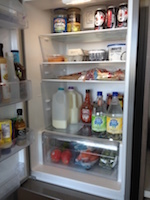 What do you typically spend on groceries each week? I spend around $150-250 on groceries/meals every week, so close to $1000 each month. How many calories a day do you typically need to eat? Approximately 3,400 calories a day. How many hours do you spend training or competing on average per day? We train on average 5-6 hours per day not including our extras that will vary each day. 3:30pm – Snack when I get home Example: bean salad, lean meat, or a sandwich. What do you spend on groceries each month? Each month I spend roughly $500 on groceries.